John MacArthur has long been concerned about the dangers of Pentecostalism and the Charismatic Movement. Over twenty years ago he wrote Charismatic Chaos which documented many of the excesses of the movement. The major criticism at the time of MacArthur's position was that he painted too broadly and thus lumped those on the lunatic fringe of charismania with those who were substantially more biblically sound. The fringe crowd, after all, composed a small minority of the total Pentecostal/Charismatic family. 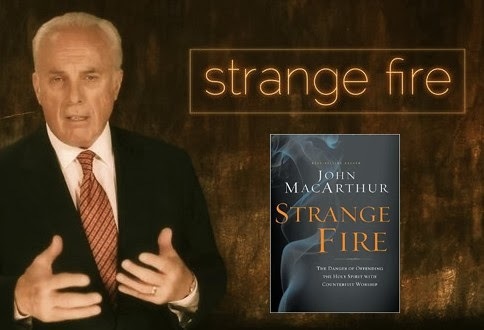 Whatever MacArthur's critics might think of Strange Fire , they can no longer claim that the extreme Charismatics are either the minority or unusual. The fastest growing, and most visible, segments of the movement are those formerly identified as fringe. There are still many doctrinally sound Charismatics within Christendom today and MacArthur takes great pains to say so (pp. 81-82). But the extremists are everywhere and growing rapidly. In addition there are newer concerns such as the Reformed Charismatics, or Neo-Calvinists, who are combining some excellent theology in some areas with openness to the charismatic gifts. These include Wayne Grudem, John Piper, D.A. Carson, and Mark Driscoll. MacArthur devotes his final chapter to pleading with these men to re-examine their position biblically. MacArthur's overarching concern is that the Pentecostal/Charismatic Movement's commitment to subjectivism and experience dominates their belief in biblical revelation (pp. 16-17) and is leading much of evangelicalism to embrace this philosophy. MacArthur traces the roots of this emphasis on subjectivism at least back to Schleiermacher and Ritschl, the founders of theological liberalism, since they replaced revelation with experience as their source of authority (pp. 215-218). Pentecostalism itself had its beginnings in the Wesleyan/Holiness Movements of the 18th and 19th centuries, but was officially birthed in 1901 by Charles Parham. The recognized start of the Charismatic Movement was 1960. Today we have witnessed the Third Wave, the Latter Rain, the New Apostolic Reformation, the Word-of-Faith and the Prosperity Gospel Movements, among others. Yet the movements are riddled with theological and practical problems. Scandals have been common within Pentecostal leadership (pp. 60-65), the doctrine of the sufficiency of Scripture has been declared demonic by some (p. 69), bogus claims abound, and believers are being led astray. What can be done about all this? MacArthur spends two chapters showing how the Christian is to test the spirits of the age (pp. 37-82). Most importantly, he clearly and often emphasizes that whatever is happening today is not what happened in the New Testament: biblical tongues were actual languages whereas tongues today are gibberish (pp. 133-154); biblical healings were undeniable, miraculous healings of organic diseases and ailments whereas healings today are unverified, selective, and practiced in controlled environments; and prophecies in the Bible were without error whereas today most are full of mistakes and are products of human imaginations. The issue of "fallible" prophecy is an important one due to its acceptance by many leading evangelicals in the Neo-Calvinism camp. Often known as continuationists, these leaders teach that the Lord continues to give prophecies today, those prophecies however, unlike biblical ones, are fallible. A certain revelation may be partly from the Lord and partly from the mistaken imagining of the "prophet." The doctrinal basis for this view is found in Wayne Grudem's groundbreaking work, The Gift of Prophecy in the New Testament and Today , and in his Systematic Theology , both of which attempt to show that, unlike Old Testament prophecy which was infallible, New Testament prophecy was flawed being a mixture of true revelation and human interpretation. MacArthur demonstrates that Grudem is wrong in his thinking and that all revelation from God is without error (pp. 105-123). Later MacArthur provides an appendix showing that his view, known as cessationism, has been the historic stance among major evangelicals (pp. 251-261). One of the important, and erroneous, criticisms of cessationism is that it diminishes the role of the Holy Spirit. MacArthur spends over 50 pages refuting this idea by showing the active ministry of the Holy Spirit in our salvation (pp. 179-195), our sanctification (pp. 197-213), and inspiration of Scripture—the means by which God speaks to His people today (pp. 213-230). He also includes a helpful discussion of the illuminating work of the Holy Spirit (pp. 224-226). Strange Fire is a timely and valuable work. The reader will learn much about the history, doctrine, dangers and influences of the Pentecostal/Charismatic Movement. For those who identify themselves as New Calvinists, and are open to the charismatic gifts of tongues, healings and prophecy, it is hoped that this book will cause them to reconsider their position.